The twelfth issue of the Sacred Harp Publishing Company Newsletter shares the stories of composers and singers, printers and cooks who contributed to Sacred Harp in the nineteenth and twentieth centuries—some well-known and others largely forgotten. It also features the growing collection and programs of the Sacred Harp Museum. Printable version of the Sacred Harp Publishing Company Newsletter, Vol. 6, No. 1 (5.5 MB PDF). Our issue begins with the history of Heard County, Georgia’s, oldest annual event, a June Sacred Harp singing that celebrated its 150th session this year. Karen Rollins details how perseverance, faith, and family contributed to the singing’s persistence. 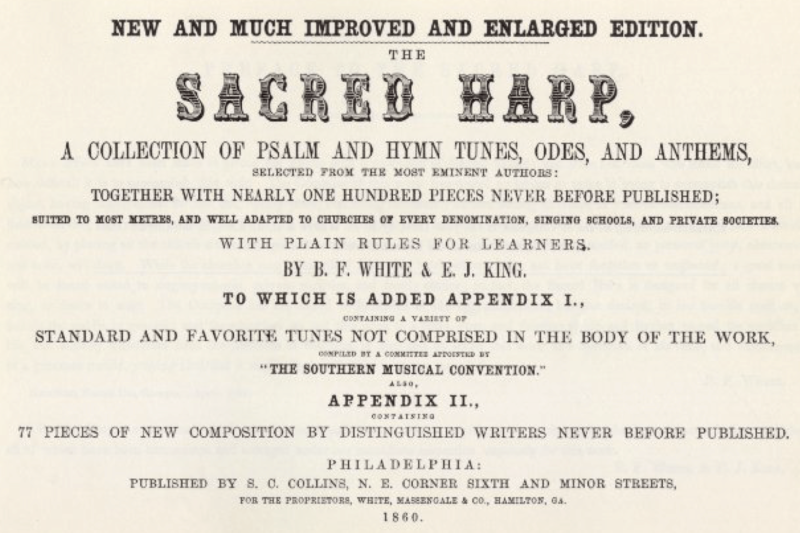 It and all other nineteenth-century Sacred Harp singings also relied on a distant yet robust network of music printers and publishers in Philadelphia. Rachel Wells Hall surveys the considerable impact this network had on shape-note tunebooks, extending even to the music we sing today. The issue next turns to key characters whose compositions, dishes, and outsize personalities enlivened singings in the twentieth century. Don Bowen describes the life of his father, E. C. Bowen, and how Sacred Harp singing came to “mean the world to him” after he rediscovered it late in life. Jesse P. Karlsberg discusses the songs of Alabama composer O. A. Parris, who borrowed harmonic and textural ideas freely from diverse shape-note genres to create unique music that nonetheless “feels just right in its intended source.” In this issue’s “Just a Minute” column, Nathan K. Rees unearths delectable details about the life of “Tubby” Walton, the charismatic head waiter who catered dinner at Atlanta’s 1935 United Sacred Harp Musical Association. “Queen of the Sacred Harp” Ruth Denson Edwards, in an article reprinted from a 1965 issue of the Harpeth Valley Sacred Harp News, offers a glimpse of her musical childhood home sure to trigger “vicarious nostalgia” in many readers. 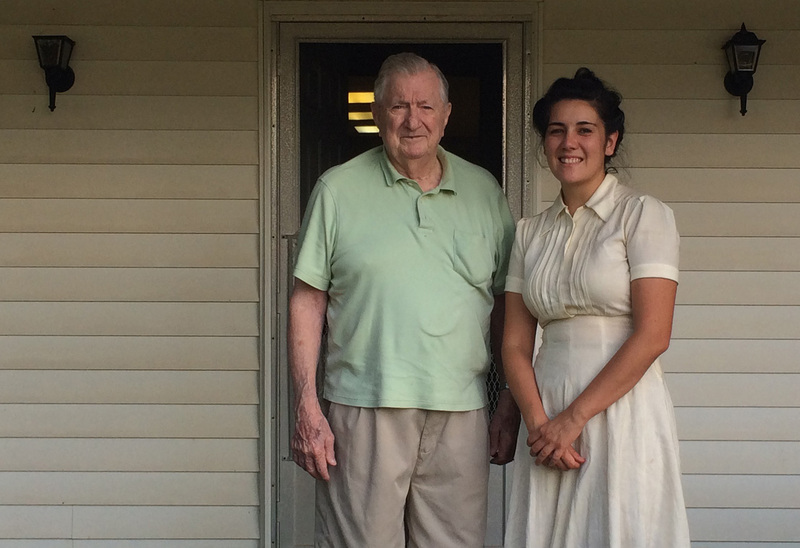 Two final essays highlight new donations to and programs at the Sacred Harp Museum. 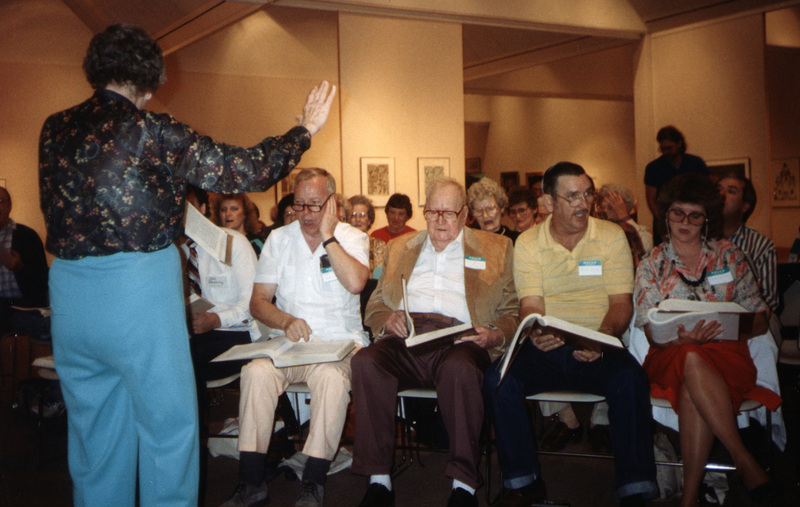 Nathan K. Rees details the backstory of a Sacred Harp edited by Timothy and Lowell Mason, published nine years before our beloved tunebook, that was recently donated to the museum by P. Dan Brittain. As the Sacred Harp Museum’s 2017 interns make strides in cataloging and archiving the museum’s collection and preserving digital photographs and recordings of Sacred Harp, Sasha Hsuczyk shares her experience piloting our internship program last summer. As always, the Newsletter team welcomes your comments on these articles. We also invite your suggestion of future topics, whether you’re interested in writing or not! Please get in touch. 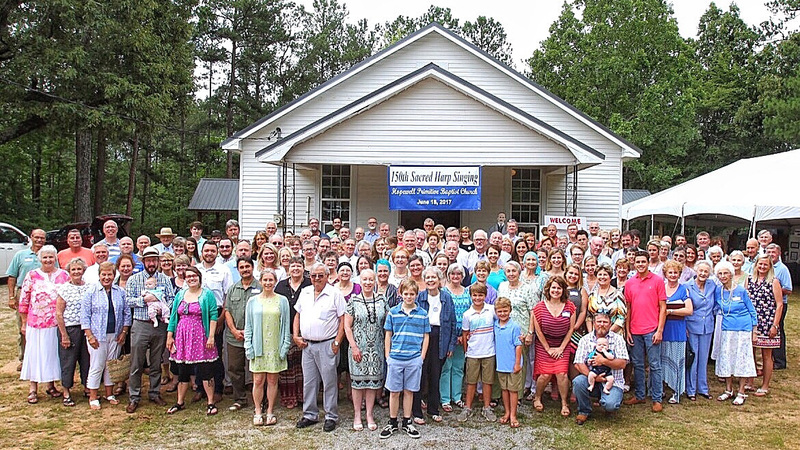 The oldest continuous event in Heard County, Georgia, is a Sacred Harp singing begun right after the Civil War on the third Sunday in June. 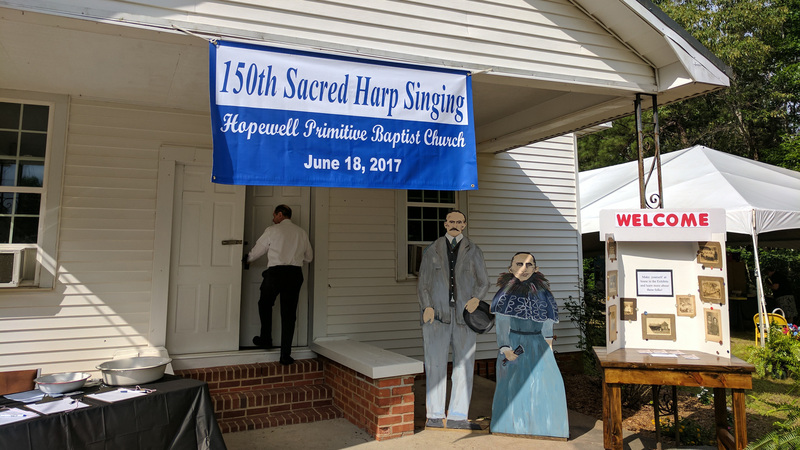 This June, the singing at Hopewell Primitive Baptist Church celebrated its 150th session with a well-attended day of singing, fellowship, and several special events. How does a small church in a small community in one of Georgia’s least-populated counties keep such an event going for so long? The answer has a lot to do with perseverance, faith, and a strong sense of family. 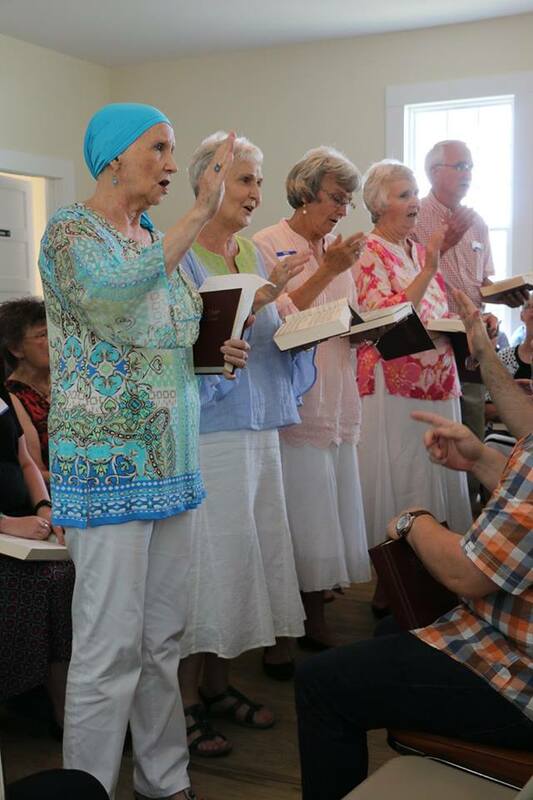 Sacred Harp singers and James A. Denney descendants from across the United States and beyond gathered for the 150th session of the Hopewell Singing. Photograph by Isaac Green. The singing was started by James A. Denney and his wife, Mary Anne Patterson Denney. James was born in January 1832. His father died of typhoid when James was sixteen, so James took over his business of farming, milling, blacksmithing, and cattle raising. He married Mary Anne (born July 1835) on Christmas Day in 1852. They settled in Troup County, Georgia. James was a large man, six feet, four inches tall, weighing 240 pounds. He wore a size sixteen shoe. Mary Anne was petite, weighing ninety pounds and a mere five feet tall. They started a family and had had three sons by the time the Civil War began. James felt it was his duty to join the Confederate war effort, so in the fall of 1862 he walked to join Company 8 of Cobb’s Legion. Because of his strong constitution and experience, he was assigned to carry the bellows on his back from battlefield to battlefield and to do the blacksmithing needed by the infantry. He was wounded at a battle near Perrysville. The shot went through his body in the stomach area. A medic placed a silk handkerchief soaked in vinegar on the ramrod of a rifle and passed it through the path of the bullet. James recovered and continued to serve. He was at Appomattox with Confederate general John B. Gordon when the war ended. With no money, threadbare clothes, no maps, and one shoe, James and a fellow soldier began the arduous trek back to Georgia. He would wear the shoe on his right foot until his left became too sore to walk; then he switched the shoe to his left foot. The trip home took three months. When James returned to his farm in Troup County, his home and mills had been destroyed, and his land had been sold for delinquent taxes. His wife and sons had hidden in a cave when the Union forces came through, but Mary Anne was able to hide some gold. With that stake, they moved to northwest Heard County and started over. James bought some land and built a log house. He added to it later and had a fine, three-chimney home. He also built a grist mill, a mill dam, a sawmill, and a blacksmith shop. 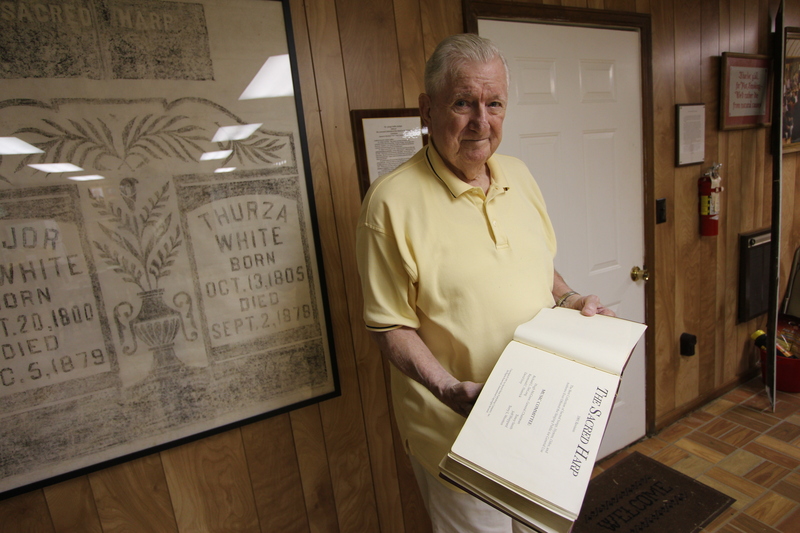 With the help of his neighbors, he built Hopewell Primitive Baptist Church. He donated the land and did 95 percent of the work on the church. He also started a Sacred Harp singing there on the third Sunday in June. A celebratory banner and life-size cutouts of six-foot-four James A. Denney and five-foot-tall Mary Anne Patterson Denney welcomed visitors to the singing. Photograph by Nathan Rees. James and Mary Anne had six more children. They now had eight boys and a girl. They were Frank, John, Cullie, James T., Lonnie, William, Charlie, Buena Vista, and Joseph. The girl, called “Bunie,” was named for Buena Vista Hill where James was wounded. James died on April 27, 1887, and Mary Anne died exactly twenty-one years later on April 27, 1908. They are buried at Hopewell. Their children and grandchildren were active in the church and singing. They settled mostly in Heard and Carroll counties, where many of the local citizens can trace their ancestry (and their love of Scared Harp) back to James and Mary Anne. In October 1984, almost 100 years after James died, a ceremony was held at Hopewell to honor James and his contributions. A plaque was unveiled, several descendants and local dignitaries spoke, a twenty-one-gun salute was sounded, and there was Sacred Harp singing. The earliest records of Hopewell are lost due to fires. One fire destroyed the church, one destroyed the home of the church clerk, and the county courthouse burned as well. These fires were in different years, but the result was that the earliest records for the church date from 1910. At that time, Elder W. T. Merrell was pastor, and James Harrison Rogers (1852–1919) was church clerk. Harrison lived in Ephesus, a town in Heard County; he had a strong bass voice and loved to sing. His son, Frank Rogers, was also a strong singer who often keyed music and was an early honoree of the Sacred Harp Publishing Company. Other singers who served as pastors included Elders Roy Avery and Homer Benefield. Church clerks were often members of the Denney or Rogers families, both of which were active in the church. The last surviving member at Hopewell was Mae Rogers. 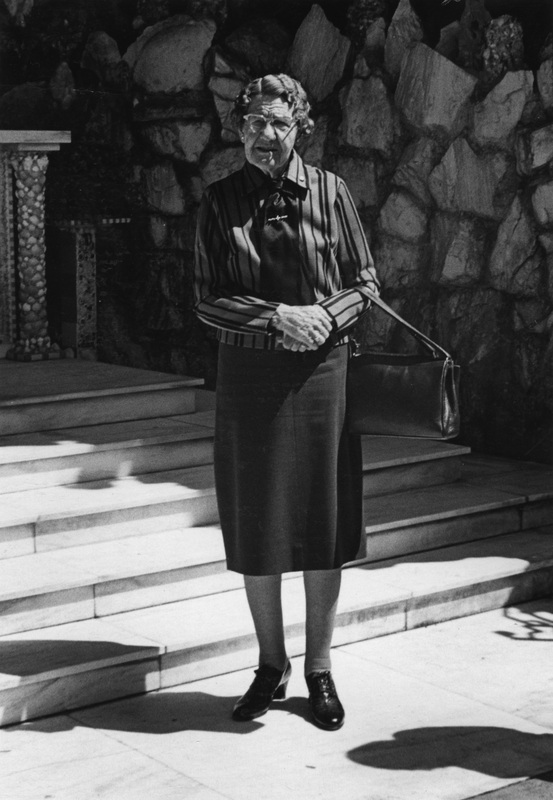 While she was alive, in October 1988, the church set up a domestic non-profit corporation to handle the business of the church. The original fifteen members of this corporation’s committee are deceased. The current committee, consisting of Denney and Rogers descendants, maintains the church and works to keep the singing going. Denney Rogers is the CEO of the corporation and Karen Rogers Rollins chairs the committee and the singing. As singers and visitors arrived, it was clear that this was a special occasion. The church was adorned with a large welcome banner across the front. Underneath, life-size cutouts of James and Mary Anne Denney greeted participants on their way inside, where special memorial fans were given as mementos to all who came. Inside a large tent at the right of the church, numerous historical and genealogical exhibits coordinated and created by Sherry Rogers Lovvorn were on display. These exhibits featured informative panels, photographs, and books documenting James and Mary Anne Denney, Buren and Mae Rogers, James T. and Laura Denney, the Shadinger family, Cullie Denney, James Harrison and Elizabeth Rogers, and Newman and Willie Myrt Denney, as well as Hopewell Church and its history of Sacred Harp singing. Some of the panels are now on display at the Sacred Harp Museum through the first weekend in November. Singers enjoying Sherry Rogers Lovvorn’s genealogical and historical exhibits under a large tent to the right of the church. Photograph by Nathan Rees. Special presentations attested to the significance of the day. 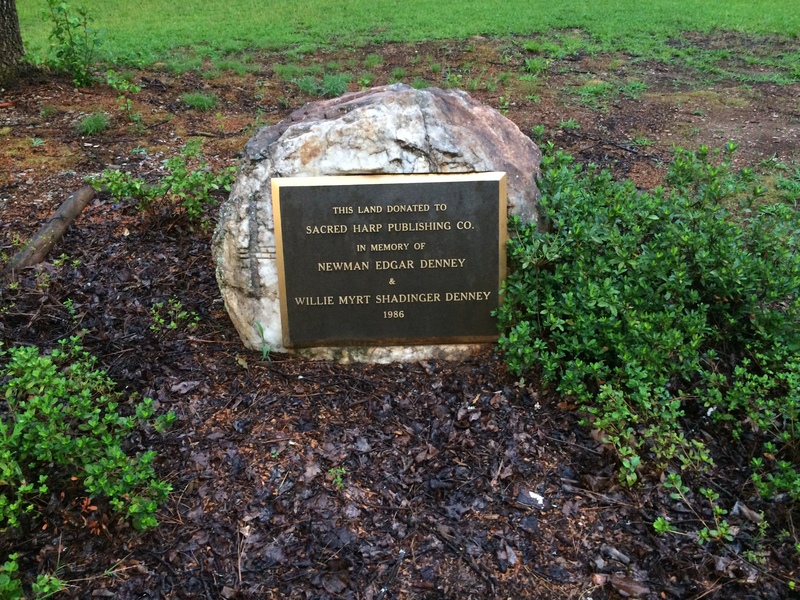 A marker was placed at the church to note the founding of the church and the singing. Randy Nix, Heard County’s representative in the Georgia Legislature, authored House Resolution 479 recognizing and commending the church and the singing on the occasion. Since he was preaching elsewhere that day, Denney Rogers, the mayor of Ephesus, presented the resolution during the singing. Not to be outdone, the state of Alabama also passed a resolution to honor the event. The representative from Auburn, Joe Lovvorn, a descendant of James A. Denney and James Harrison Rogers, presented the resolution. Rogers family siblings (left to right) Karen Rogers Rollins, Karleen Rogers Williams, Paige Rogers Harrod, Sherry Rogers Lovvorn, and Denney Harrison Rogers standing in descending order of age while leading during the memorial lesson. Photograph by James Robert Chambless. During the singing, awards were presented to the children of the last church clerk, Buren Rogers, and to the oldest descendant of James and Mary Anne present: Eris Denney Muse. The youngest descendant present was also recognized. And, in honor of James, an award was also given for the tallest person present and the one with the biggest feet. There were also awards for the singers who traveled the farthest to attend, one for those outside the United States and one for those inside America. Opal Rogers Cannon from Leesburg, Georgia, shared her memories of singing there with her father, Frank Rogers, and her siblings. And, of course, there was singing. Singers from England, Germany, and Ireland joined those from many states to sing the old songs and enjoy the day. There were many fathers and children present which was appropriate since it was Father’s Day. Of course, the third Sunday in June had not yet been designated as Father’s Day when the singing started 150 years ago. Maybe James and Mary Anne, buried not far from the church building, could hear the fasolas and rejoice in the fact that their families and friends are continuing the tradition. This article draws on the records of Hopewell Church and personal recollections, as well as two books: History of Heard County, Georgia, 1830–1990 compiled and published in 1991 by the Heard County Historical Society, Cullie and Mollie Denney: Parents and Descendants, compiled and published in 1998 by Diane Denney Rooks and Violette Harris Denney. The original 1844 edition of The Sacred Harp bore the name and address of a Philadelphia publishing house: T. K. & P. G. Collins. Although B. F. White’s journey from Hamilton, Georgia, to Philadelphia would have been several days long, he published four editions of The Sacred Harp with Collins, both before and after the Civil War. As a resident of Philadelphia, I was curious to find out more about the city’s role in the story of The Sacred Harp. I eventually discovered that Philadelphia had a much deeper connection to shape-note music than I had thought. 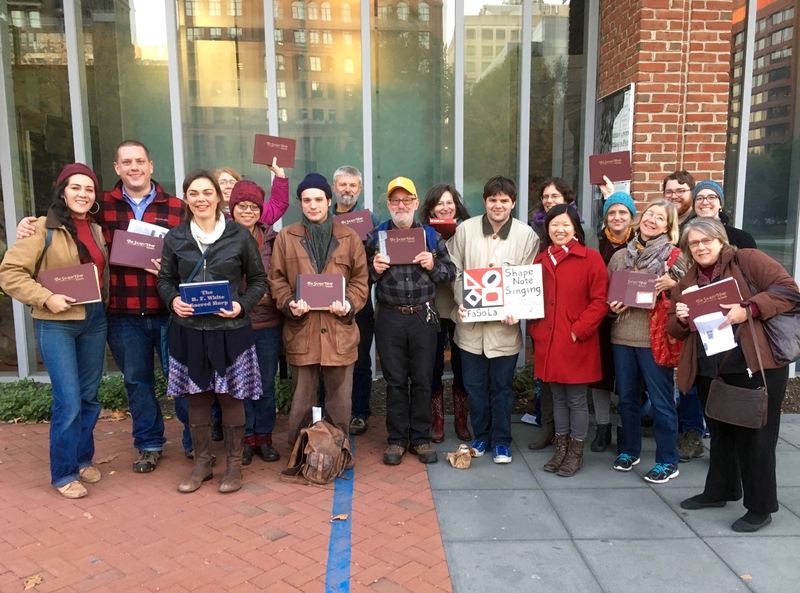 My research culminated in a November 2016 tour of central Philadelphia publishing sites connected to shape-note music. Connelly’s letter of permission for the first four-shape book, The Easy Instructor. From Wikipedia. Although shape-notes were associated with southern and western music,1 the most successful four- and seven-shape notation systems have their origins in Philadelphia, which was also the place of publication of many bestselling shape-note books. The merchant John Connelly designed the four note shapes used in The Sacred Harp in 1798 and the first edition of The Easy Instructor (1801) was printed in Philadelphia using these shapes. In 1846, Jesse B. Aikin of nearby Chester, Pennsylvania, published The Christian Minstrel, the first book printed in what was to become the most enduring seven-shape notation system. Aikin’s shapes are used in The Christian Harmony: 2010 Edition and some contemporary church hymnals and gospel books. Several Philadelphia-printed shape-note books were enormously popular. By 1879, William Walker’s Southern Harmony had sold about 700,000 copies, followed by The Sacred Harp and The Christian Minstrel, which sold about 250,000 and 194,000 copies, respectively.2 These numbers are particularly impressive, given that the population of the United States was about 45 million at the time and shape note music never caught on in New England. One difficulty in researching Philadelphia history is that streets were renamed and numbered several times in the nineteenth century. I used the Greater Philadelphia GeoHistory Network’s Interactive Maps Viewer to reconcile old and modern addresses.5 T. K. & P. G. Collins’ factory, where The Sacred Harp was probably printed, was located at 1 Lodge Alley, later renamed and renumbered as 705-707 Jayne Street. Jayne Street has since been renamed Ranstead Street, so the modern address where the Collins factory stood is 705-707 Ranstead Street. The 1860 edition of The Sacred Harp gives the location “N.E. Corner, Sixth and Minor Streets” where the book was for sale. Minor Street between Fifth and Sixth was removed in the 1950s to make way for Independence Mall. Collins’ bookstore would have been almost exactly on the spot where the Liberty Bell is now on display. E. W. Miller’s publishing house was in the Ashmead Building at 1102 & 1104 Sansom Street, formerly called George Street. Philadelphia singers and friends gather near a location where The Sacred Harp was sold, now the home of the Liberty Bell. Photograph courtesy of Rachel Hall. 705-707 Ranstead Street, once the site of the T. K & P. G. Collins factory and now a loading dock in an alley. Photograph courtesy of Rachel Hall. 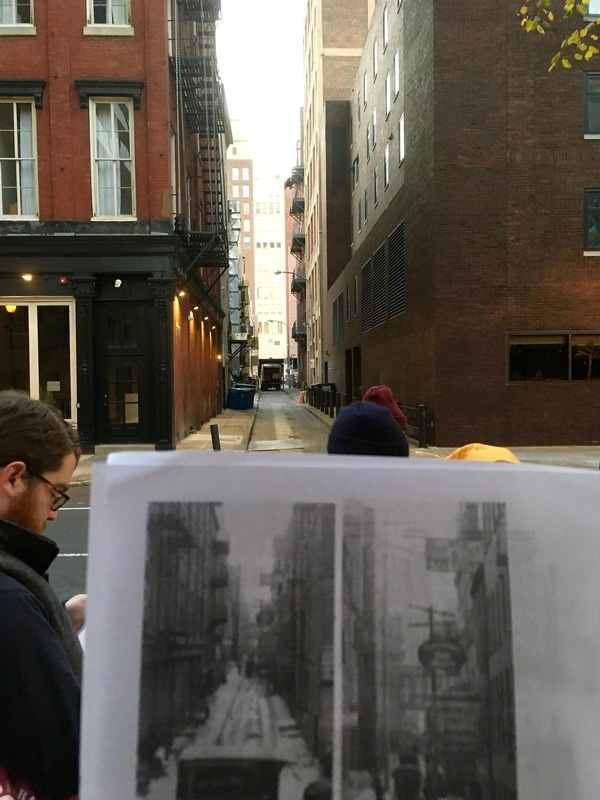 View of Ranstead Street from Seventh Street, then and now. The Collins type foundry and printing house signs appear in the old photograph. Most of the nineteenth-century buildings on the left side of the street are still standing. Photograph courtesy of Rachel Hall. Printed image from the Philadelphia Free Library Digital Collections. Although none of the buildings associated with the Collins and Miller firms survive, there are a number of maps and illustrations that do. An 1872 floor plan and inventory of the Ashmead Building, where Miller rented two floors, was made for insurance purposes and included in the Hexamer General Surveys of Philadelphia.6 We learn that Miller occupied the fourth and fifth floors of the building and employed forty people, of whom twenty-four were women. 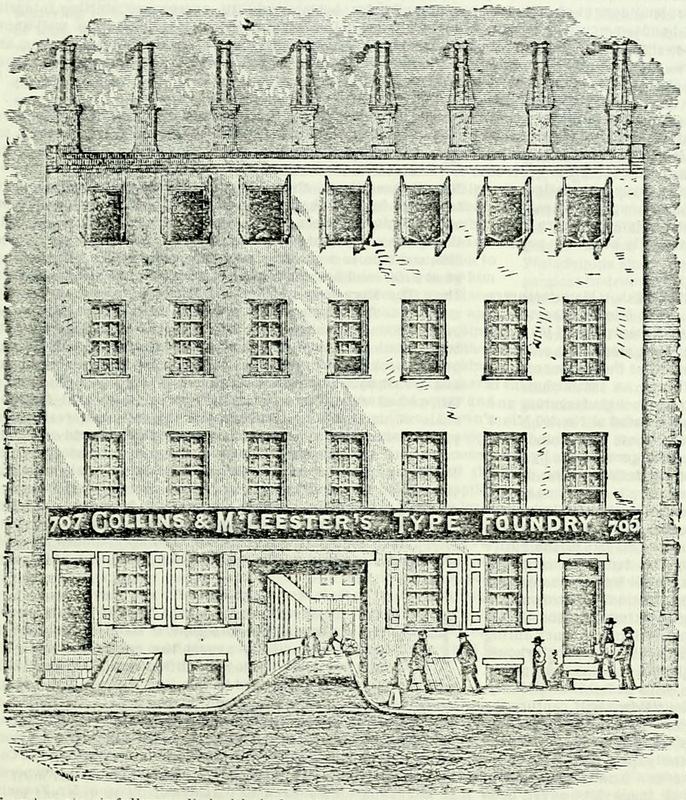 The Philadelphia Free Library also has an engraving of the Ashmead building.7 Collins’ factory appears in maps,8 an illustration,9 and an 1889 photograph of the 700 block of Ranstead Street, showing a portion of the façade and signage for Collins’ type foundry and printing house.10 More remarkable still, Cornelius T. Hinckley’s 1852 article “A Day’s Ramble Through the Mechanical Department of the ‘Lady’s Book,’” no. 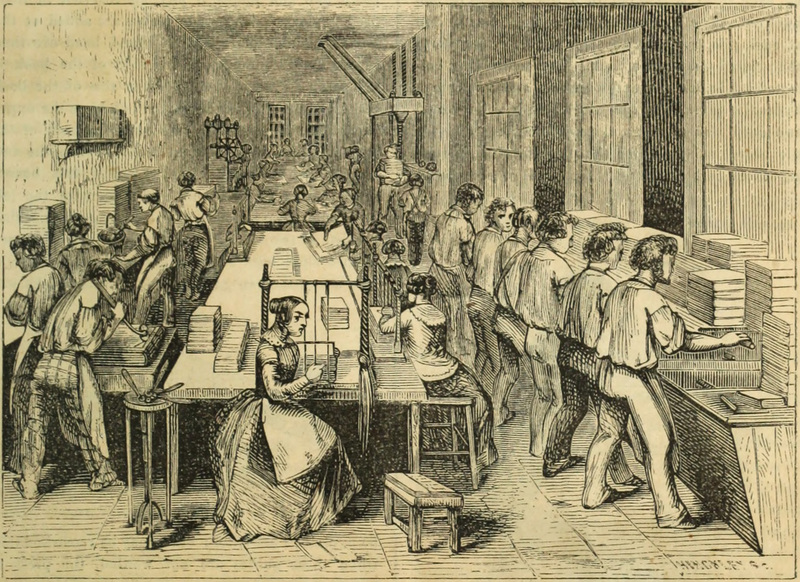 V in his “Everyday Actualities” series for the Godey’s Lady’s Book, narrates a visit to the Collins’ brothers’ printing factory (where the Lady’s Book was printed) with numerous engravings of not only the interior and exterior of the building but also the building’s occupants at work.11 I imagine that the Collins brothers treated William Walker and B. F. White to a similar tour. 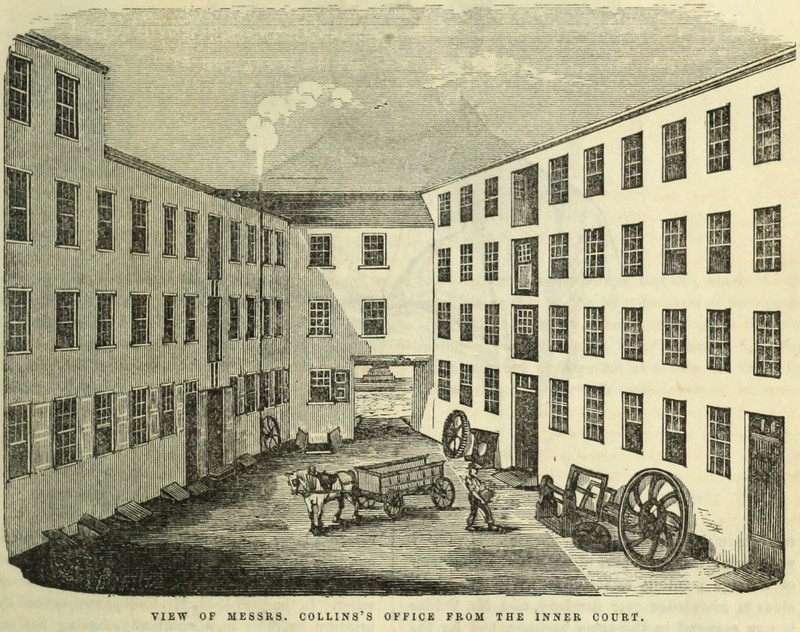 Courtyard of the Collins factory in 1853. Engraving from Godey’s Lady’s Book, October 1852. Collins & M’Leester’s Type Foundry. Engraving from Illustrated Philadelphia, 1889. This documentation of Philadelphia publishing sites, together with what is known about similar shape-note books allows us, to some extent, to reconstruct The Sacred Harp’s journey from manuscript to finished product. 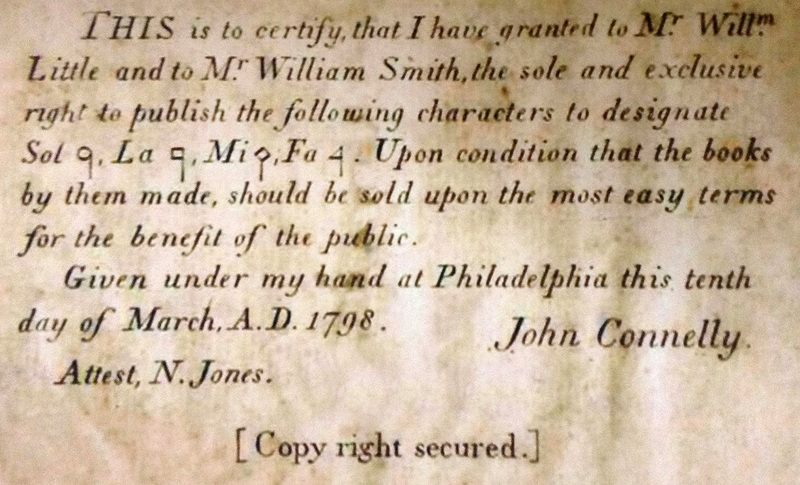 Before B. F. White visited the Collins factory in Philadelphia, he and E. J. King would have assembled a manuscript for The Sacred Harp. Although their manuscript didn’t survive, some contemporaneous manuscripts did. Pennsylvania author Samuel Wakefield, composer of “Fatherland” (p. 449 in The Sacred Harp), published his Sacred Choral in 1854. A manuscript copy of it is at the West Overton Museum in Scottdale, Pennsylvania. While this manuscript is entirely handwritten, the copy of Wakefield’s American Repository in the museum has been cut, presumably for the purpose of pasting songs into a new manuscript.12 White and King’s Sacred Harp manuscript probably contained a number of pages of (or page references to) The Southern Harmony. 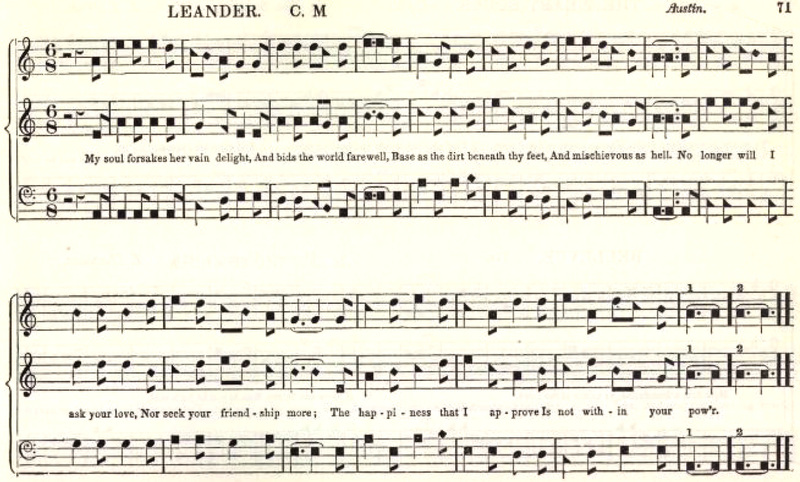 For example, the typography—including line breaks and note stem direction—of “Leander” (p. 71) is almost identical in The Sacred Harp and The Southern Harmony, which suggests that White and King either pasted the Southern Harmony page into The Sacred Harp manuscript or supplied a page reference. Samuel Wakefield’s manuscript copy of The Sacred Choral. Photograph by Rachel Hall. Wakefield’s copy of his American Repository (1835) has been cut, presumably for the purpose of pasting songs into another manuscript. Photograph by Rachel Hall. “Leander,” p. 128 in The Southern Harmony. 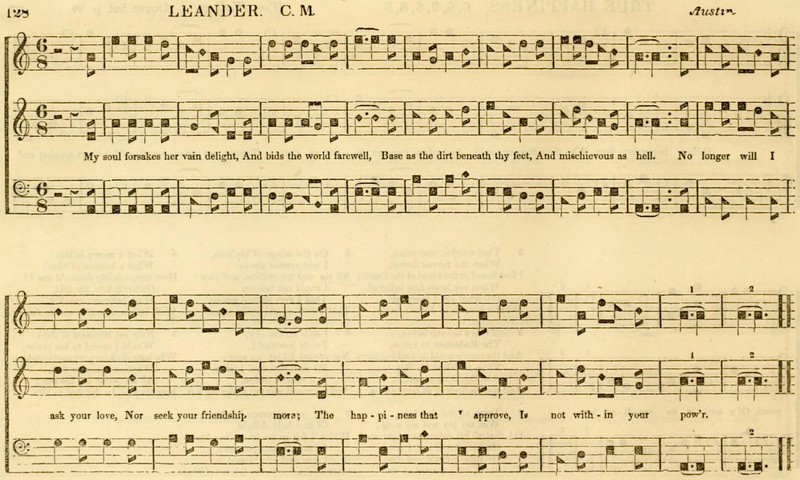 “Leander,” p. 71 in The Sacred Harp. 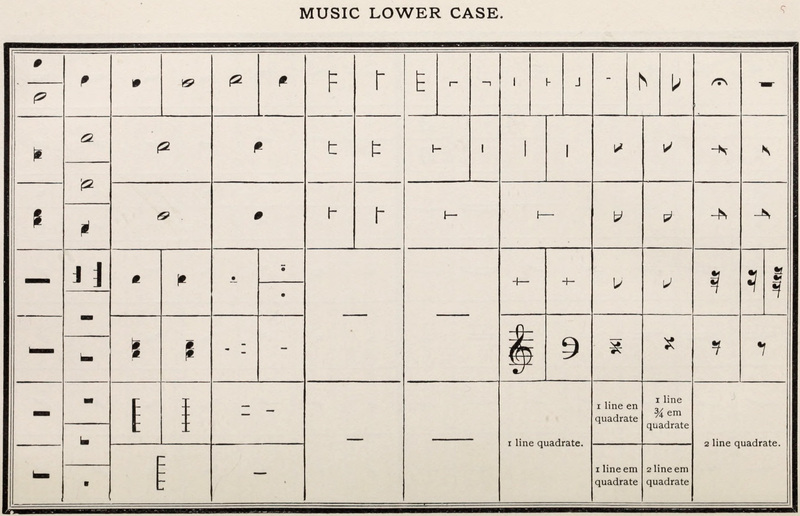 Plan of a music typesetter’s type case containing individual pieces of round-note mosaic type. Image from The American Printer, p. 118. Shape-notes, by 1923 “strange-looking” to those outside the South, could be substituted for the round note heads in the type case. Image from Popular Mechanics, September 1923. Men and boys typesetting and women operating steam-powered printing presses in the Collins factory. Engraving from Godey’s Lady’s Book, October 1852. Hinckley’s article in the November 1852 issue of Godey’s described bookbinding and distribution at the Lippincott firm in Philadelphia.15 Large sheets were folded and sewn together. The assembled stack of pages was then pressed and its edges cut. Finally, binding was attached. 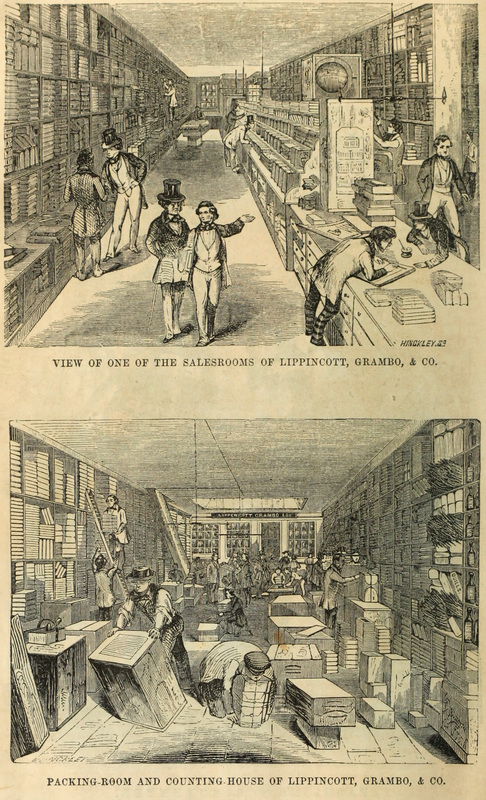 Books were sold at Lippincott’s bookstore or packed to be shipped elsewhere.16 Although all the shape-note books manufactured in Philadelphia were advertised to be sold locally, they clearly had a more specific regional audience. Four-shape books like The Sacred Harp were most popular in the South. Hayden’s Sacred Melodeon seems to have been more popular in the West, while The Christian Harmony was marketed in the South. 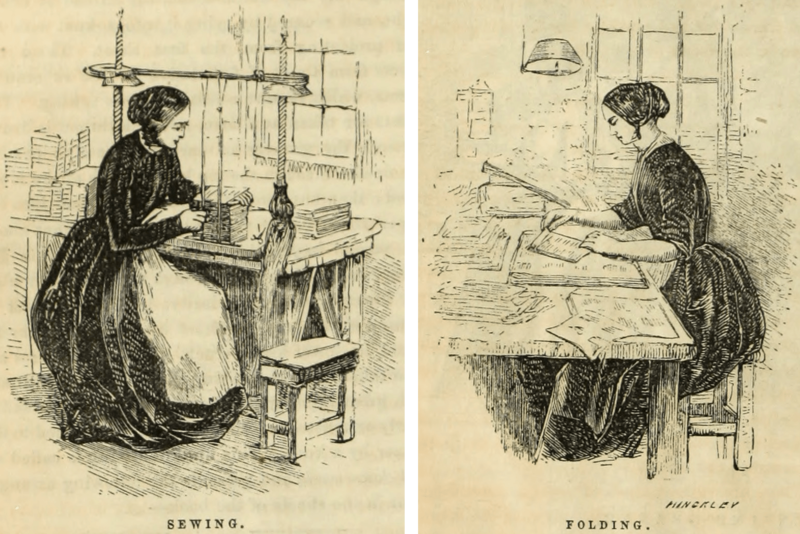 Folding and sewing was women’s work. Engravings from Godey’s Lady’s Book, November 1852. The Lippincott bookbinding shop. Engraving from Godey’s Lady’s Book, November 1852. The Lippincott book warehouse and salesroom. Engravings from Godey’s Lady’s Book, November 1852. Hinckley’s account makes clear that factory jobs were gender-specific, as was typical at the time: women operated the large printing presses, folded the sheets, and sewed them together, while men performed heavy labor such as pressing and packing books and skilled work such as typesetting. 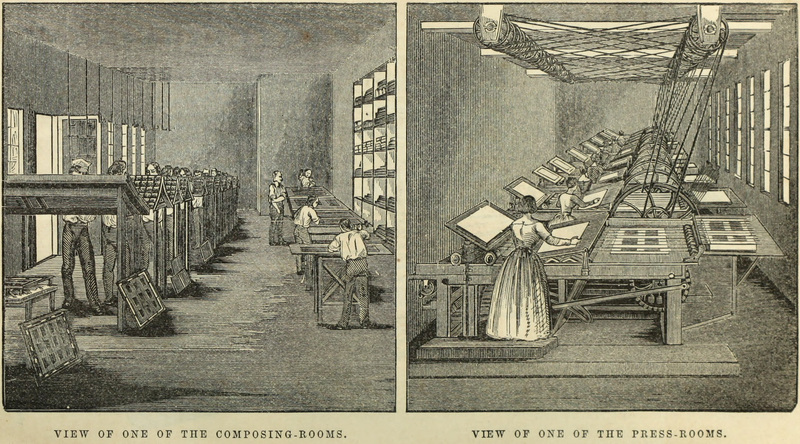 I was surprised by the sheer number of women employed in printing (about two dozen in each factory). Referring to the Collins factory, Hinckley remarks, “We cannot say whether the attraction is in the beautiful working of the machinery, or in the faces of the bevy of industrious working girls who attend there.”17 Although his sentiments are quite dated, the images of women at work are striking, though I can’t help but think about how uncomfortable their dresses must have been in the summer heat. In addition to publishing books, individuals at the Collins firm contributed directly or indirectly to southern shape-note music. As related in volume 3, no. 2 of the Newsletter, Elphrey Heritage, the composer of “Warning” (p. 213b) and “The Savior’s Call” (p. 489), was T. K. & P. G. Collins’ bookkeeper.18 He contributed songs to additional books published by Collins: The Hesperian Harp, The Christian Harmony, The Social Harp, The Christian Minstrel, Harmonia Ecclesiae, The Sacred Melodeon, and The Timbrel of Zion. Title page of the 1857 edition. The 1860 edition omits Augusta and Charleston, perhaps due to the impending war. Photograph courtesy of Wade Kotter. The Timbrel of Zion had a small effect on The Sacred Harp. When J. S. James compiled his edition of The Sacred Harp in 1911, he pasted or copied at least two songs from the Timbrel into his manuscript: “Green Street” (p. 198) and “Beyond the Starry Skies” (p. 512 in the James book). As these songs are not in The Christian Harmony, James most likely found them in the Timbrel. James also mentioned the Timbrel a number of times in his commentaries—“cheese notes”—on individual songs, demonstrating that he had access to a copy. The New Sacred Harp (1884), published in seven shapes by B. F. White Jr. and J. L. White, contains numerous arrangements of songs that exactly match those in the Timbrel. Its authors chose the Timbrel arrangements of familiar songs like “Mear” and “Lenox” (pp. 49b and 40) over the original versions in their father’s The Sacred Harp and older books. “Devotion,” showing the historical alterations to individual notes. The alto part mainly comes from Hayden’s Introduction to Sacred Music (yellow); changes were made in The Timbrel of Zion (pink) and the 1911 (blue) and 1966 (green) editions of The Sacred Harp. The last three notes of the treble originate in the 1844 Sacred Harp (purple). All other notes are from Johnson’s original setting (uncolored). The Philadelphia connection also indirectly accounts for at least two of the alto parts in The Sacred Harp: those for “Devotion” and “Leander” (pp. 48t and 71). Amos Sutton Hayden of Ohio included precursors of these altos in his four-shape Introduction to Sacred Music (1835) and seven-shape Sacred Melodeon (1848). 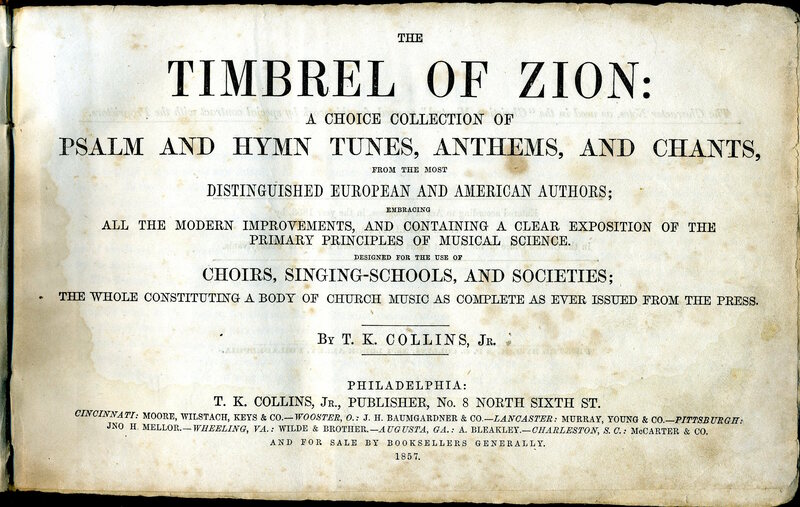 The latter book was a Collins publication and source for some of the songs in The Timbrel of Zion. When Walker added altos to three-part songs that he had published in The Southern Harmony, he sometimes turned to arrangements in other books rather than write his own parts. The altos he added to “Devotion” and “Leander” in The Christian Harmony match those in the Timbrel. Although attributed to S. M. Denson, the altos in 48t and 71 match those in The Christian Harmony and presumably came into the 1911 Sacred Harp through that book. 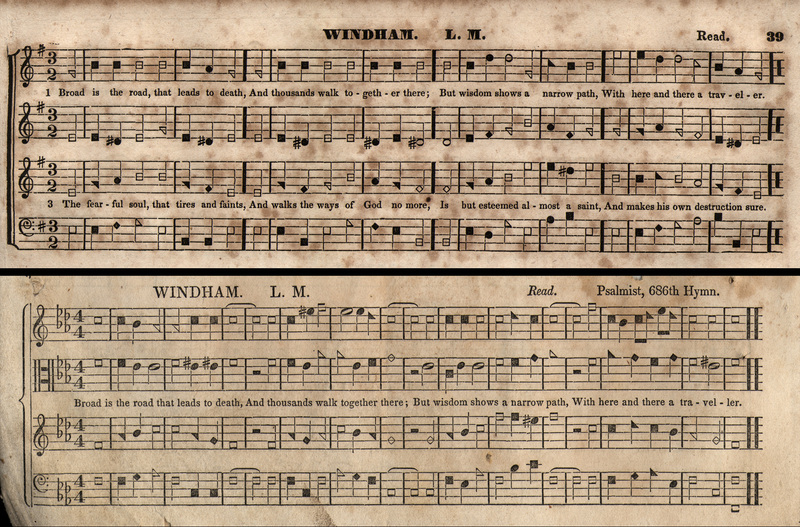 Thus, the “Philadelphia connection” accounts for a few songs—and a few stray notes—in The Sacred Harp, slightly more songs in The New Sacred Harp, and a large number of songs in The Christian Harmony. I conclude this article, as I did the tour, with the skilled Philadelphia artisans who literally “shaped” shape-note music: type founders and setters. The J. M. Armstrong Company continued to design and typeset shape-note books, including hymnals and gospel songbooks, well into the twentieth century.20 Theirs, at 710 Sansom Street, is the one building connected to Philadelphia’s central role in shape-note music publishing that survives. 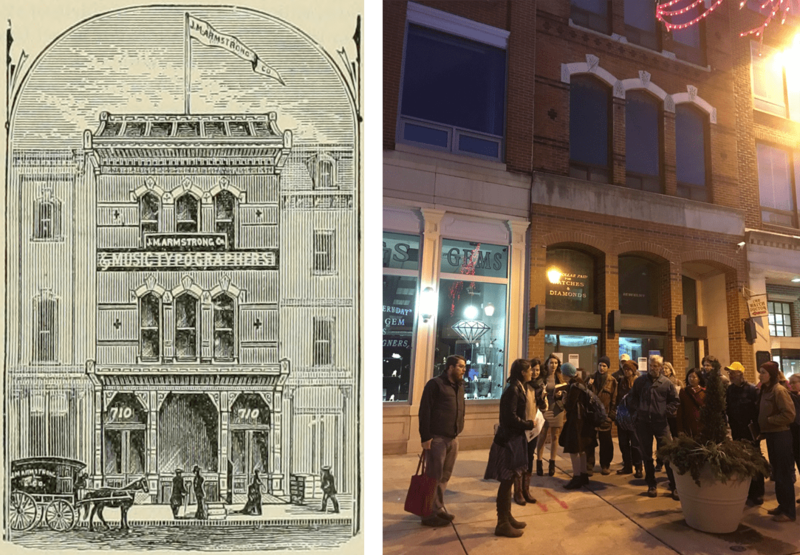 J. M. Armstrong, Music Typographers, 710 Sansom Street, then and now. Engraving from Historical and Commercial Philadelphia, p. 171. Photograph courtesy of Rachel Hall. I am grateful to Jesse Polhemus, Robert Vaughn, and Wade Kotter, who assisted with my research on The Timbrel of Zion. We often think of Sacred Harp and gospel music as opposites. Especially for singers from the 1991 Edition, the style can seem anathema; its relative exclusion a sign of the tunebook’s fidelity to the “old paths” invoked in its dedication. According to Raymond Hamrick, the first act of the book’s music committee was to “erect a sign [proclaiming] ‘No Gospel Music.’” Orin Adolphus (“O. A.”) Parris (1897–1966), a prolific composer who contributed songs to the 1936 and and 1960 editions of Original Sacred Harp (precursor to the 1991 Edition), 1954 and 1958 editions of The Christian Harmony, and dozens of gospel songbooks, saw things differently. For Parris, as for Hamrick, shape-note genres were distinct, arrayed along a spectrum with Sacred Harp on one side, gospel music on the other, and Christian Harmony somewhere in between. Yet Parris also believed that lyrical and musical styles from one shape-note genre could serve as great inspiration for a composition intended for another. O. A. Parris as a young man. Parris served in the armed forces in New Jersey as a bugler during World War I. Photographs courtesy of Dawn Caldwell. In a new essay in the journal American Music, “Genre Spanning in the Close and Dispersed Harmony Shape-Note Songs of Sidney Whitfield Denson and Orin Adolphus Parris,” I describe how Parris and Denson navigated this musical landscape.1 Here I summarize and expand upon my argument by focusing on Parris’s unique and masterful approach to crafting new tunes in these three shape-note styles. Parris contributed five fuging tunes to The Sacred Harp: three to the 1936 edition of Original Sacred Harp: Denson Revision (“A Cross for Me,” “Eternal Praise,” and “The Better Land”; pp. 349, 377, and 454 in The Sacred Harp: 1991 Edition) and two more to the Original Sacred Harp’s 1960 Supplement (“A Few More Years,” since removed, and “My Brightest Days”; p. 546). These songs demonstrate both his keen understanding of the tunebook’s musical styles and his interest in adding flavors drawn from gospel music. “The Better Land,” for example, features an inventive variation on the standard fuging tune entrance pattern, and four strongly melodic parts that frequently cross each other, all markers of his awareness of the conventions of the Sacred Harp fuging tune genre. Yet “The Better Land” also contains gospel sounds, such as a moment near the song’s end where, as I note in American Music, “the alto part slides through the flatted seventh scale degree creating a diminished mediant chord (iiio), a sonority that would not be out of place in a gospel song yet which occurs nowhere else in The Sacred Harp.” I also describe in American Music how “gospel may have influenced Parris’s construction of the song’s fuging form. … Although in most fuging tunes the four parts come together for a short homophonic section before ending, “The Better Land,” like many gospel songs, remains relatively polyphonic until the last note.”2 Together, these features of the song suggest it was constructed vertically, with harmonic progressions in mind, as well as horizontally, with an eye toward melody, a fusion of aspects of “close” and “dispersed” harmony songwriting strategies. Even Parris’s minor Sacred Harp songs, such as his masterful “Eternal Praise,” show a keen awareness of each part’s melodic interest as well as the rhythmic counterpoint and harmonic progressions caused by the parts’ interaction, illuminating Parris’s indebtedness to conventions of both Sacred Harp and gospel music. Hundreds of O. A. Parris’s compositions were published in annual paperback gospel songbooks such as the Tennessee Music and Printing Company’s 1934 Pearls of the Cross. Collection of the Author. Parris channeled the bulk of his creative energies toward the gospel side of the shape-note genre spectrum, famously claiming that he wrote so little Sacred Harp music “because there’s no do(ugh) in it.” Many of the hundreds of songs he contributed to the annually published paperback “new books” used at gospel singing conventions both exemplify the diverse styles found in such songbooks, and evince echoes of some aspects of Sacred Harp music. For example, Parris’s gospel songs feature basslines that range energetically across an octave or more in combinations of arpeggio and stepwise motion to generate melodic interest far greater than that exhibited in a typical gospel song, perhaps a result of his enthusiasm for the melodic harmony parts common to dispersed harmony. Parris’s gospel songs also feature a heaping helping of the various rhythmic effects producing textual overlap employed in the gospel genre. Historical evidence suggests that such effects originated in the mixed-race close harmony traditions of the nineteenth century and were not an outgrowth of fuging tunes. Yet in Parris’s mid-twentieth-century musical world, in which fuging tunes and gospel responsorial effects existed side by side, the composer may have envisioned a connection between the two, inspiring his unusually extensive and creative applications of textual overlap in a variety of gospel songs, most of which unfortunately are now inaccessible in long out-of-print gospel songbooks. Happily, The Christian Harmony contains several examples of this hybrid approach. In “The Grand Highway” and “Longing for the Day” (pp. 172 and 320 in The Christian Harmony: 2010 Edition, hereafter CH2010), virtuosic choruses begin with staggered part entrances typical of fuging tunes followed by call-and-response effects more common to gospel songs. These two songs as well as “Weary Rest” and “He’s Holding My Hand” (pp. 1 and 296 in CH2010), which hew more closely to the standard fuging tune form in The Christian Harmony, originated in gospel songbooks where they featured less part crossing, more chromatic harmony, and in some cases additional responsorial effects.3 That Parris adapted songs he published in gospel songbooks for The Christian Harmony illustrates his sense that hybrid compositions had a place in both sources. The changes he made demonstrate that he saw their stylistic ranges as distinct. O. 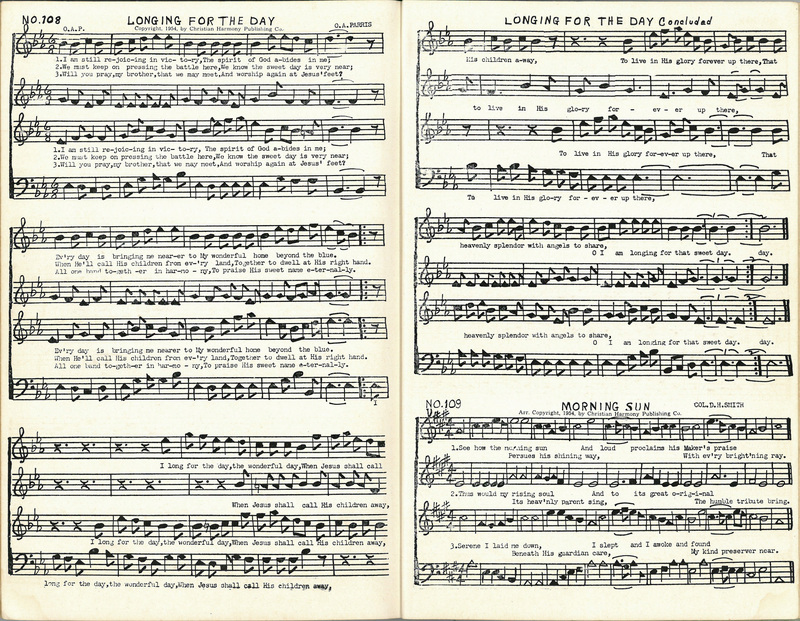 A. Parris’s “Longing for That Sweet Day,” composed for a gospel songbook, mixes close and dispersed harmony as well as fuging and gospel responsorial effects. 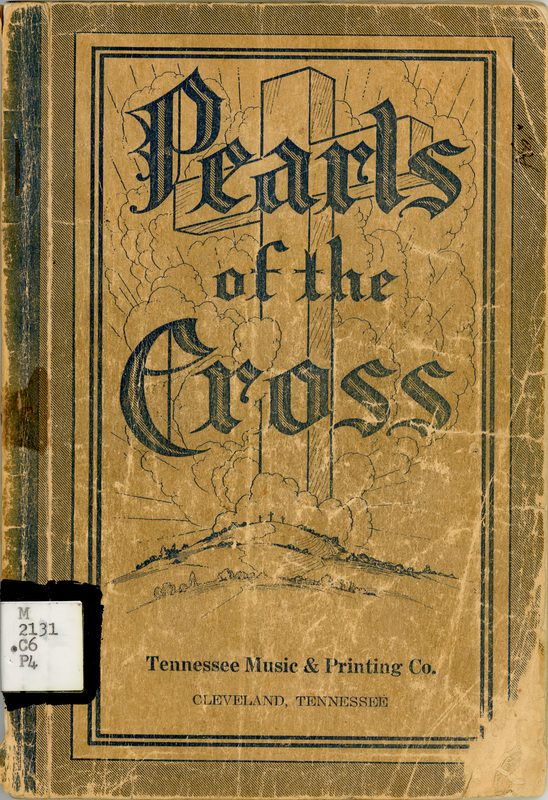 In Pearls of the Cross (Cleveland, TN: Tennessee Music and Printing Company, 1934), no. 82. Collection of the author. O. A. Parris revised “Longing for That Sweet Day,” removing some accidentals and call-and-response rhythmic flourishes associated with gospel. He included the resulting song, “Longing for the Day,” in his 1954 Christian Harmony: Book One (Birmingham, AL: Christian Harmony Publishing Company, 1954), no. 108. Collection of the Sacred Harp Museum. Parris also seems to have felt that some gospel genres fit better in The Christian Harmony than others. Of the twenty-three songs he contributed to 1954 and 1958 editions of the tunebook, only “A Happy Meeting” (p. 182 in CH2010) approaches the complexity and pure gospel flavor of the two-page-long songs that typically occupy openings just past the midpoint of convention books. 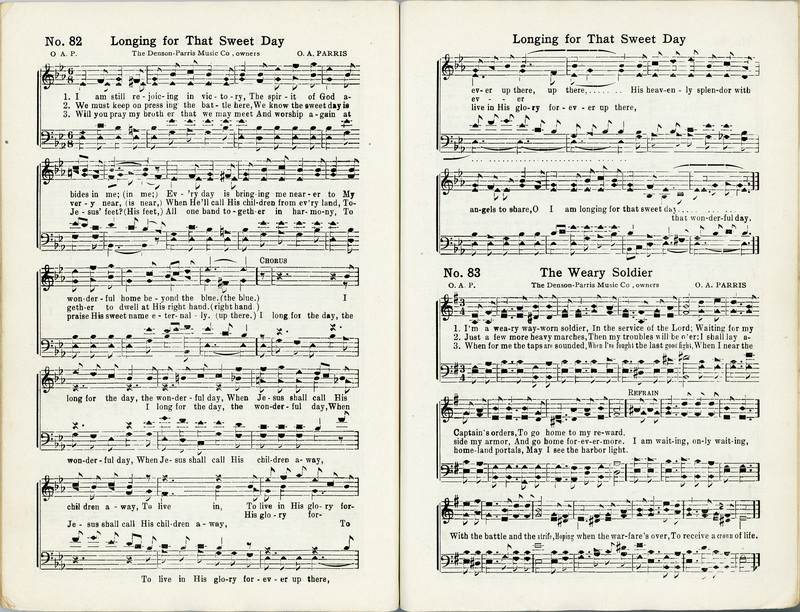 In addition to the gospel fuges mentioned above, and more conservatively written fuging tunes with less overt gospel influence, Parris contributed several adaptations of simpler gospel songs that occupied a secondary position in gospel songbooks, the three or four braces left over on the right side of a page opening, following a longer and more virtuosic composition. Examples in The Christian Harmony include “The Heavenly Throng,” “A Good Time Coming,” “Sunrise,” and “The Weary Soldier” (pp. 43, 149, 168b, and 305 in CH2010). Parris seems to have felt that this shorter and less elaborate gospel genre fit more easily along the varied nineteenth-century genres in The Christian Harmony. Mae Lewis Parris and O. A. Parris, ca. 1925. Photograph courtesy of Dawn Caldwell. From his gospel show-stoppers to his minor fuging tunes, Parris’s music evinces a great ear for melody, expressed not only in his tenor lines but in all the parts. Favorite harmony parts of mine are the bass in “Eternal Praise” and the treble to “A Happy Meeting.” Parris’s harmony parts also elegantly interact with each other both rhythmically and melodically, like pieces of a puzzle snapping together. Like many of his mid-twentieth-century contemporaries—a group that included several Densons, Kitchenses, McGraws, and Woodards—Parris applied his creativity across the shape-note music spectrum. As I note in American Music, genre-spanning composers were especially prominent in the northern Alabama area “stretching roughly from Birmingham north to Cullman and west to Jasper.”4 But among this group, Parris seemed perhaps the most at home in the widest range of genres, capable in songs like “The Better Land” and “The Grand Highway” of mixing and matching elements from different styles while creating music that feels just right in its intended source. Thanks to the Christian Harmony Music Company for permission to include “Longing for the Day” as an illustration to accompany this essay, and to the descendants of O. A. Parris for permission to include “Longing for that Sweet Day,” its gospel precursor. Thanks to Dawn Caldwell for sharing photographs of her grandfather. The minutes of the 1935 United Sacred Harp Musical Association record that Walton’s Home Cooked Meals catered dinner. Courtesy of the Sacred Harp Museum. Last, but first, I recommend to all of you for a unanimous vote of thanks, the Walton family, who “cooked” their way into our hearts. We want them to know that we deeply appreciate the valuable services which they rendered. “Tubby” was an indispensable head waiter, tossing his priceless puns to each and every one of the guests. The meals were very appetizing, and enjoyed by all. As McGraw’s note suggests, “Tubby” Walton was quite a character. William Hewlette Walton was a local celebrity in Atlanta, known for a personality as expansive as his person. The only people who cared about his given name, he claimed, were “the revenue man and a traffic cop.” To everyone else, he was just Tubby, a name he had more than earned; as one acquaintance put it, “Once upon the days of Herbert Hoover’s poverty-stricken regime, there wasn’t a towel made that would have spanned the breadth of William Hewlette Walton. In contrast to the economy of the times, he was as big as a side of beef.”1 Tubby Walton sold insurance, played catcher for the Atlanta Crackers, and scouted for the Saint Louis Cardinals. He and his father operated a restaurant near what is now the I-20/I-85 interchange—he was presumably connected to the United Convention by his sister, who had married Ted Knight, a prominent Atlanta Sacred Harp singer and longtime secretary of the convention. Walton’s Home Cooked Meals was located at 193 Whitehall Street SE, near Atlanta’s then-booming downtown. 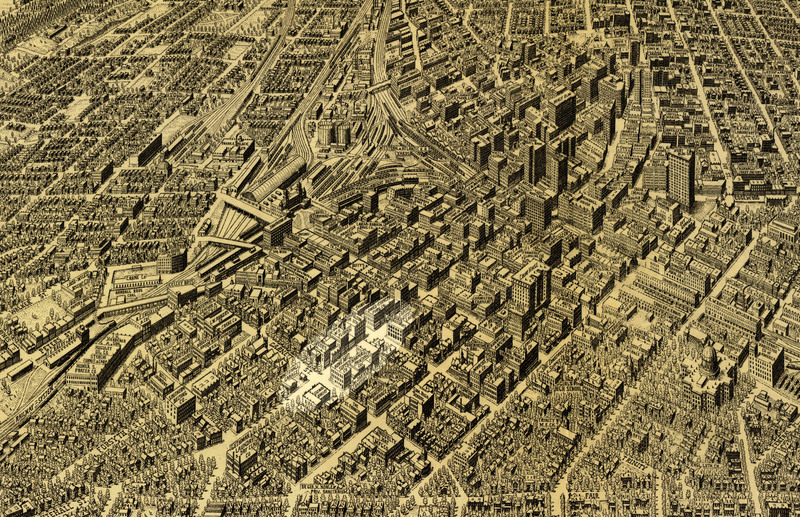 This detail from a 1919 map of the city by Foote and Davies, then also printer of J. S. James’s Original Sacred Harp, show’s the catering company’s approximate location. Courtesy of the Library of Congress, 75693190. Tubby was revered for his profuse “country” wisdom, much of which, unsurprisingly, revolved around food. City life hadn’t dulled Tubby’s affection for the country cooking he grew up with near the town of Corinth (about halfway between Newnan and LaGrange). His favorite dish was chitlins: “I could eat one as long as from Atlanta to Griffin, with plenty of detours. I kid you not, Cousin, chitlins is good eating and if you ain’t ever tried them you don’t know what you’re missing. They can have their paddy far de graw and their quail on toast but Tubby’ll take his chitlins every time.”2 Regrettably, the minutes fail to reveal what was on the menu at the United Convention when Tubby cooked. Although Tubby’s in-laws were noted Sacred Harp singers, he didn’t start out as much of a singer himself. Of his Sunday School days, he wrote, “They’d be singing ‘What a Friend We Have in Jesus’ and they’d be rounding third while Tubby was still chugging along toward first base.” Eventually, a friend somewhat indelicately pointed out this musical deficiency; as Tubby noted, “Anytime they don’t want you to sing at Sunday School, look here beloved, you need HELP.”3 But Tubby was determined to improve, so he sought out music lessons, and eventually even recorded a couple of gospel albums late in life. 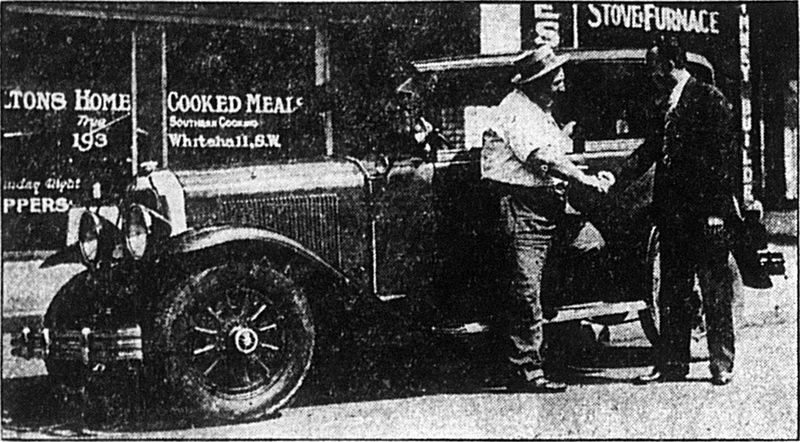 Tubby Walton (left), depicted in the July 21, 1929, issue of the Atlanta Constitution (C3) under the headline “‘Tubby’ Walton Buys a Buick,” with the Walton’s Home Cooked Meals storefront visible in the background. Evidently, even the fact that this colorful character had “been a Buick enthusiast for many years” was newsworthy! Courtesy of Emory University. Thanks to Adam P. Newman. Eventually, Tubby got out of the restaurant business. A friend recalled that “when he found he was giving away more meals at the back door than he was selling up front, he closed the kitchen and quit.”5 Tubby Walton’s name doesn’t appear in any other minutes that I’ve come across, so it seems that he didn’t catch the bug for Sacred Harp. And it’s too bad! Unlike the Corinth Sunday School, we know enough not to run off a singer who’s that generous a person and that good of a cook, no matter what their voice sounds like. 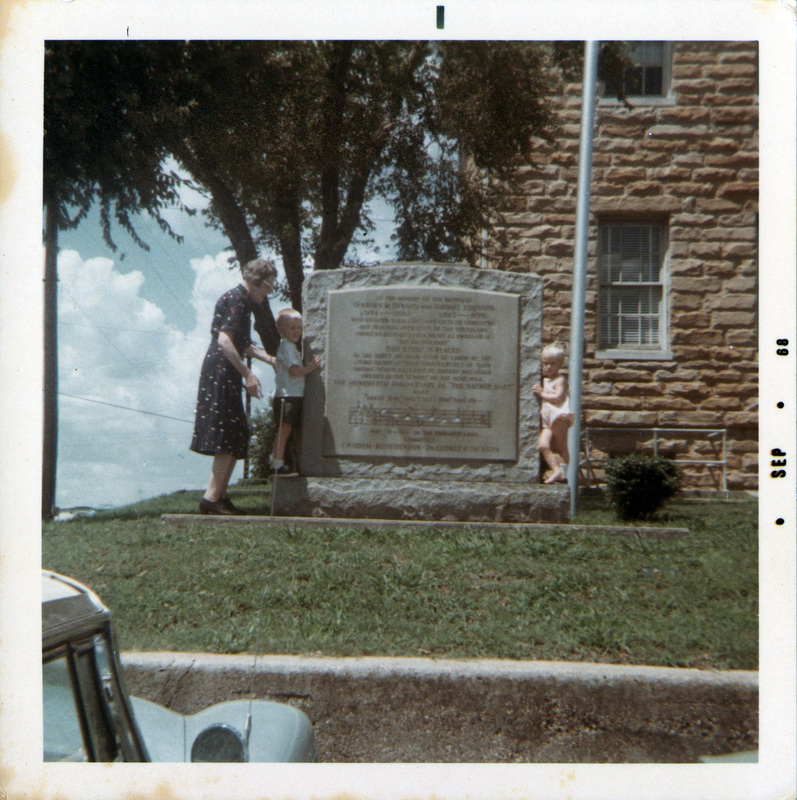 Editor’s Note: In this essay, “Queen of The Sacred Harp,” Ruth Denson Edwards shares memories of her musical childhood home. Just about every day somewhere in the world Sacred Harp singers find joy and spiritual fulfillment singing songs written by the Denson family members who gathered around a big log fire to sing in The Sacred Harp at night. Edwards describes how these gatherings formed the apex of a rich musical environment that also included folk songs, string music, and quartet singing. Oh, to have heard T. J., Amanda, S. M., and Sidney Denson, all outstanding singers and composers, singing “Call John,” the confounding and humorous song that appeared for a time in the rudiments of Original Sacred Harp! In her reminiscence, Edwards also describes the effort of hosting an annual singing and the texture of a life without radio, television, or much in the way of reading material. We thank Mrs. Edwards for her “I Remember” in this issue. It will bring vicarious nostalgia to most of us as we envisage those wonderful times the Denson family had in the memorable occasions in their home. Mrs. Edwards carries on a tremendous amount of Sacred Harp work, and is an unquestioned authority in the field. Thanks to Tim Reynolds, current editor of the Harpeth Valley Sacred Harp News, for permission to include “I Remember” in this issue of the Sacred Harp Publishing Company Newsletter. Collection of the Sacred Harp Museum. No person has more pleasant childhood memories than I, for no one ever had a happier childhood. My parents, the late Thomas J. Denson and the late Amanda Burdette Denson, owned a farm in Winston County, near Helicon, Alabama, and there they reared their family. At that time our family consisted of my older brother, Paine, my foster brother, Pansy Mitchell (who was the orphan son of my mother’s sister), my older sisters, Annie and Maggie, my younger brother, Howard, and me. I like to remember the family, sitting in a semi-circle before a big log fire at night, singing in the Sacred Harp. Pansy sang bass; mother, alto; Paine and Annie treble; Dad, Maggie, Edward, and I sang tenor. During the singing hour, Paine popped corn and at recess we would enjoy buttered salted popcorn. Some nights, Dad would lead off on folk songs, and the family group would join in and harmonize. (I am sure that I did not help very much, but I was “there” and I “sang.”) Some of the folk songs were: “I’m Going from the Cotton Fields,” “There’s One More River to Cross,” “Oh, Sister Mary, Lean on the Lord’s Side,” “Hump-Backed Male,” “Noah’s Ark,” and others. On other nights, when Uncle Seab and Aunt Sidney were visiting us, we would have a concert of string music. Uncle Seab would play the fiddle; Dad would beat the straws and sing; Paine and Maggie would pick their banjos; Annie would pluck her harp; Pansy blew his harmonica; and mother, Aunt Sidney, Howard, and I sang. Uncle Seab and Aunt Sidney’s visits were rays of sunshine in my life. They and my parents had such good times singing quartets: “Kay-Did,” “Rain on the Roof,” “The Laughing Chorus,” “Tis Better to Whistle than Whine,” “Call John,” and others. Radio and television made their advent about fifty years too late. They really missed a treat. Soon after lunch, on July 3, visiting singers began to arrive at our house. They came and came, and my parents gave all a hearty welcome. One night, forty people spent the night with us. On the morrow, we all went to the singing. The Thomas J. Denson children sat in the class and sang all day. That was his iron-clad rule. At recess, everyone enjoyed pink lemonade, and at noon, we all feasted on the delicious food that the ladies had prepared. At the time that I am describing, there were no recreation centers, no radios, televisions, picture shows, etc. as we have today. There were few books available. The Atlanta Constitution (a weekly) was our only newspaper and we received a few monthly magazines. Our group participation strengthened the family ties, supplied our wants and needs, and enabled us to live rich, full, and happy lives. I am proud of my musical heritage and am glad to say that Sacred Harp music has always been my joy and inspiration and my love for it increases as the years pass. I am truly thankful for my wealth of happy childhood memories. The Sacred Harp that we sing from today was not the first book by that name. In fact, it was not even the first oblong shape-note tunebook with that title. A decade before B. F. White published the first edition of The Sacred Harp, brothers Lowell and Timothy Mason published their own Sacred Harp in Cincinnati. The Sacred Harp Museum is fortunate to have an exceptionally well-preserved copy of the 1835 edition of Timothy and Lowell Mason’s Sacred Harp thanks to the generosity of P. Dan Brittain. Originally from Boston, the Mason family is hardly associated with the promotion of shape-note (or “patent note”) notation—indeed, Lowell Mason would become a famously successful antagonist of shape-notes, which he derided as an obstacle to “scientific” music education. The Sacred Harp was undertaken at the request of many highly respectable individuals, who have long felt the importance of the introduction of an elevated style of Sacred Music arranged on the immovable basis of science and correct taste. … It is now given to the public with the hope that it will meet the wishes of those who have for a long time felt the need of a collection of scientific music adapted to the improved and improving taste and judgement of the western community. Compare Mason’s rearrangement of Daniel Read’s “Windham” (top) with White’s version (bottom), which closely follows Read’s original. Mason changed the tune to triple time, eliminating the treble/bass solos; he also substantially altered the harmony, particularly in the treble part, which fills in a number of open chords, including the final chord—a harmonic feature in minor music entirely absent from B. F. White and E. J. King’s The Sacred Harp as well as its descendent, The Sacred Harp, 1991 Edition. Furthermore, Lowell Mason seems to have purposefully given many of his tunes the same names as earlier compositions by American composers—hoping, apparently, that his new, European-style hymns would supplant the old-style music whose names they appropriated. “Northfield,” by Lowell Mason; no relation to Jeremiah Ingalls’ 1800 tune by the same name, one of the most popular early American fuging tunes. 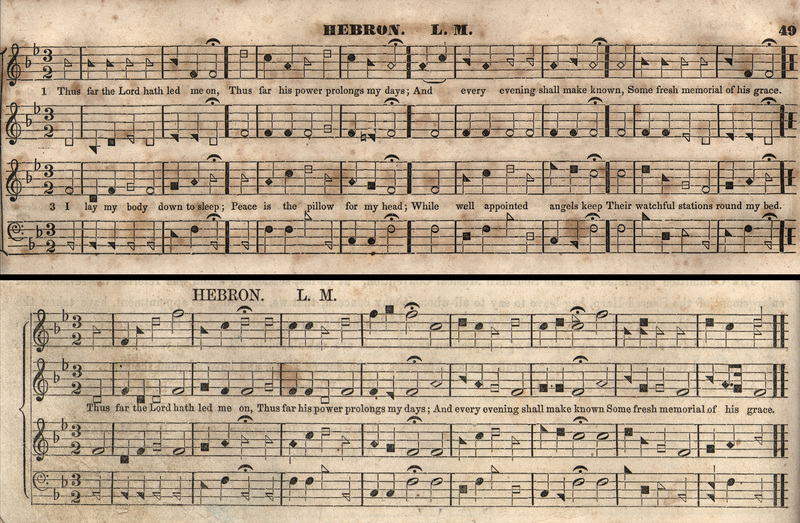 Note how the rearrangement of Mason’s “Hebron” in White’s Sacred Harp dramatically reinvents Mason’s relatively-static treble part as a melodic line in the dispersed harmony idiom. Or, perhaps B. F. White’s use of the title was not a coincidence at all. Could White have appropriated Mason’s title in much the same way that Mason repurposed the tune-names of early American compositions, creating an entirely new and radically different volume with the intent of supplanting its namesake’s influence? However coincidental, it is remarkable that a shape-note tunebook published with the intent to drive shape-note music from the south and west would share its name with the tunebook most associated with the survival of the form. In any case, by the mid twentieth-century, singers had arrived at a creative interpretation of the tunebook’s name that gets to the heart of our experience of the music whether or not it has any historical basis: the “Sacred Harp” is the human voice, the only God-given instrument. 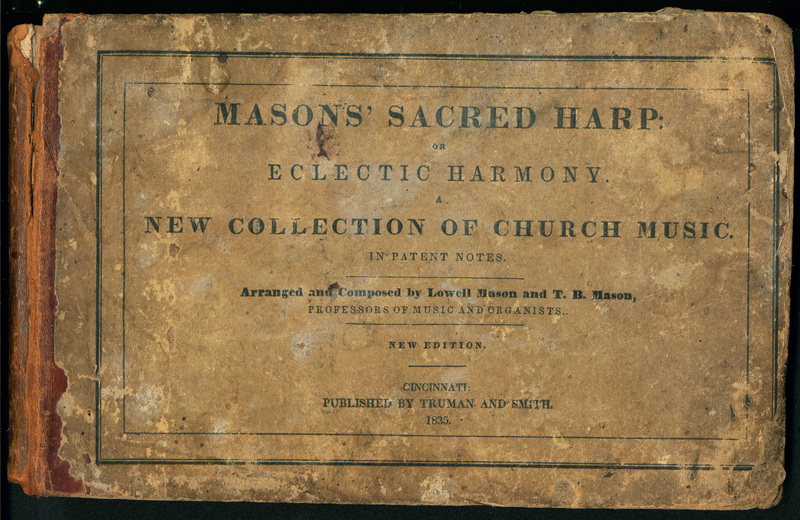 A digitized version of the same edition of Lowell and Timothy Mason’s Sacred Harp that P. Dan Brittain donated to the Sacred Harp Museum is available at the Internet Archive. For further reading, see James Scholten, “Lowell Mason and his Shape-note Tunebook in the Ohio Valley: The Sacred Harp, 1834–1850,” in Contributions to Music Education 15 (Fall, 1988), 47–52; John Bealle, “Timothy Mason in Cincinnati: Music Reform on the Urban Frontier,” in Public Worship, Private Faith (Athens: University of Georgia Press, 1997), chap. 1; Warren Steel, The Makers of the Sacred Harp (Urbana: University of Illinois Press, 2010), 9, 49–51, 134–35. Editors’ Note: The Sacred Harp Museum made great strides this summer in cataloging, archiving, preserving, and digitizing our collection thanks to Sasha Hsuczyk’s service piloting our new internship program. Below Sasha shares her experience living and working at the Sacred Harp Publishing Company Headquarters during her stay. The Publishing Company looks forward to hosting our 2017 interns, Nancy Novotny and Andy Ditlzer, to build on this foundation. Please visit our internship page to learn more about the program. Our internship program is possible thanks to generous donations from members of the Sacred Harp community. We welcome your support. Sasha with Hugh McGraw at the museum’s entrance. Photograph by Jesse P. Karlsberg. During the summer of 2016 I had the opportunity to spend a month working in the Sacred Harp Museum in Carrollton, Georgia, as the first resident intern in the Museum’s new internship program. I felt “like a kid in a candy shop” as I spent a blissful month learning, researching, connecting with people, and singing. I was peering into the Sacred Harp’s history as I dug through a treasure trove of artifacts, while simultaneously experiencing it as a contemporary tradition by attending singings and sharing fellowship with singers. 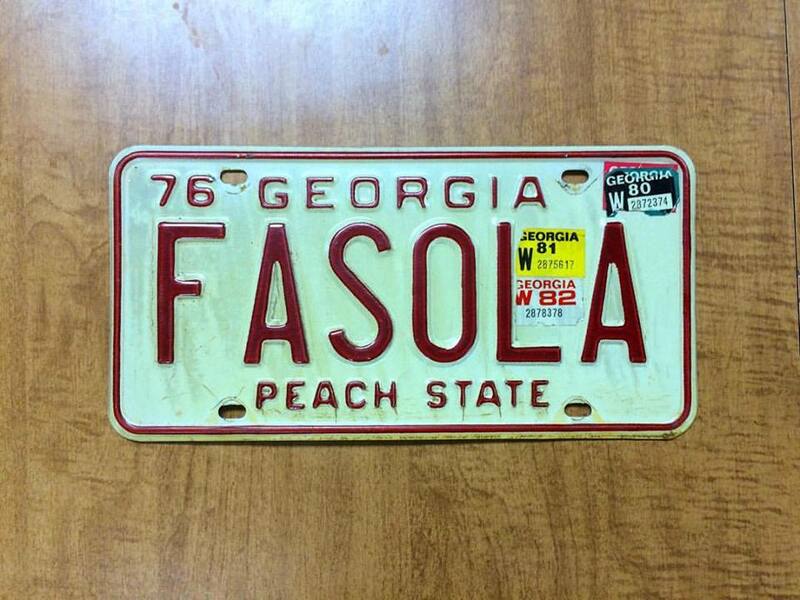 Hugh McGraw’s old license plate, part of the Museum’s varied collection. Understanding the origins of cultural traditions has always been of interest to me. I began singing from The Sacred Harp in the fall of 2010. As my enthusiasm for Sacred Harp singing grew, so did my curiosity about its history and the people who have kept the tradition going. This curiosity eventually led me to Camp Fasola in Alabama, and then on many subsequent singing trips down South. I started to try to think of ways to spend some length of quality time in the South to attend singings and further my understanding of the tradition and its people, so I was delighted when the opportunity arose to work at the Sacred Harp Museum as the first participant in a pilot internship program. 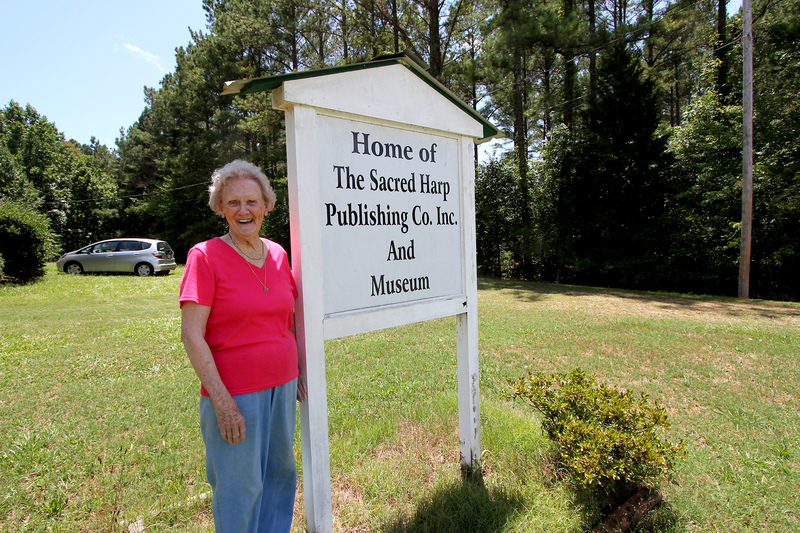 The Sacred Harp Publishing Company Headquarters stands on land donated by the Denney family. The Museum is located in the Sacred Harp Publishing Company Headquarters, on land donated by the Denney family, who have sung in West Georgia for many generations. During my time there, locals Philip and Gail Denney made me feel very welcome by kindly attending to my comfort in the museum, visiting frequently, and even inviting me for homemade meals. Philip took me down the road from the Museum to see historic Emmaus Primitive Baptist Church, where his family has worshiped and sung for over a century, and where Sacred Harp singings are still held. I was delighted to learn from Philip that A. J. McLendon, the composer of one of my favorite songs, “Sister’s Farewell” (p. 55 in The Sacred Harp), was once the clerk at Emmaus, and that some members of the McLendon family are buried there. 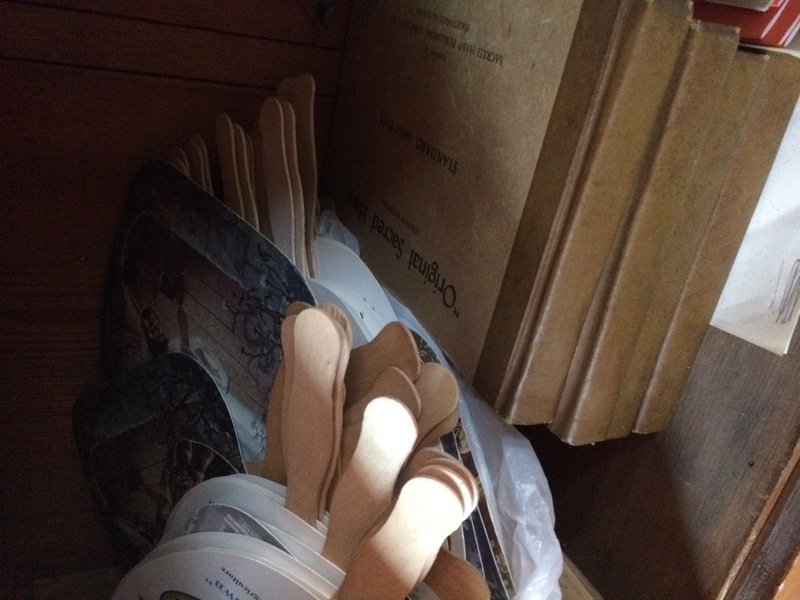 Old copies of The Sacred Harp and traditional fans inside a cabinet at Emmaus. I would often begin my days at the Museum sitting on the front porch in a rocking chair, gazing out on the field across the road, crossing things off of a work list and adding new things to the bottom. The sun was strong and the days hot, save for a few with much-needed rainfall that Philip explained was a blessing during a particularly dry summer. I found the museum’s peaceful and quiet setting in a rural area outside of the city of Carrollton particularly conducive to productive work. Because the Museum is filled with such an amazing variety of material, it was a task just to decide where to start with it all. I worked with the museum’s curator, Nathan Rees, and director of research, Jesse P. Karlsberg, to formulate a plan for my internship; we agreed that the highest priority was to begin the process of cataloging and digitizing the collection while ensuring that materials are cared for with proper archival methods. The museum’s collection includes video and audio recordings of singings, original copies of historic shape note tune books, photographs of singers and singings, letters to and from a variety of significant singers, music manuscripts, copies of The Sacred Harp that belonged to notable singers who have passed, and other singing-related ephemera. Many objects have a unique connection to specific singers, since much of the collection was donated by singers and their relatives. 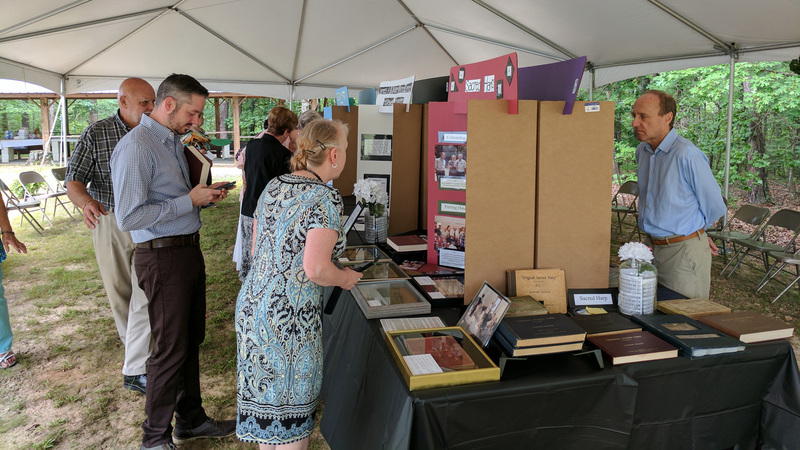 One significant part of the collection is a set of scrapbooks put together by life-long singer and dedicated Sacred Harp community member, Charlene Wallace. She filled a number of large books with carefully cut-out newspaper clippings and fliers from past singings. Charlene, who has been the driving force behind the museum since its inception, came for a visit and an interview early on during my stay and shared many singing stories, always with a sense of humor. Charlene Wallace outside the museum. 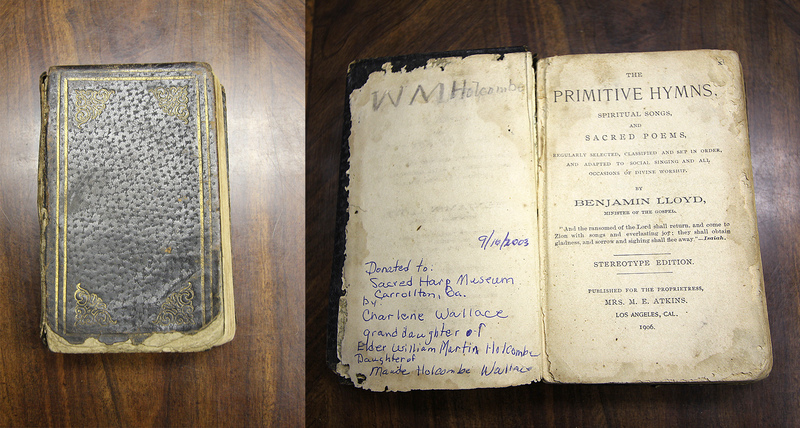 Charlene Wallace donated her grandfather’s copy of Benjamin Lloyd’s Primitive Hymns to the museum. Another visitor who came for an interview was Hugh McGraw, who led the Sacred Harp Publishing Company for a generation and oversaw the Museum’s creation. He gave me a tour of the headquarters building and recounted many amusing tales with his well-known endearing charm. Hugh McGraw at the Museum. One of my personal Sacred Harp-related interests is listening to field recordings of old singings, and so I was naturally drawn to a chest of drawers that contained an abundance of cassette tapes. Of all the tapes I went through, the most compelling to me was a recording of two small-group home singings from 1966 and 1969. The tape was accompanied by a hand-written list of the singers present for the recording, but not much other information. Based on some of these names I ventured it was recorded somewhere in West Alabama, and was eager to know more about who the singers on the list were. Some months later, I attended a night singing in Huntsville, AL, where I met Lomax Ballinger, who grew up singing in West Alabama. He was able to identify all of the singers on the list, many of whom were direct relatives of his. It is exciting to be able to share such a special recording—and a great example of the important resources that we’re able to preserve and make accessible at the Sacred Harp Museum. “Morning Prayer” (p. 411), recorded at the home of Elmer Conwill, September 23, 1966. Listen to the entire recording. Ultimately, my work culminated in the implementation of a cataloging system that will help visitors navigate the collection; nine manuscript collections of items from the museum organized by topic; the beginning of a digital audio archive of the museum’s cassette tapes; and a collection of digital files that includes letters, accounts of Sacred Harp history, photographs, and musical compositions. I hope that this work can pave the way for future interns at the museum and eventually lead to a complete and thorough catalog of the museum’s collection. 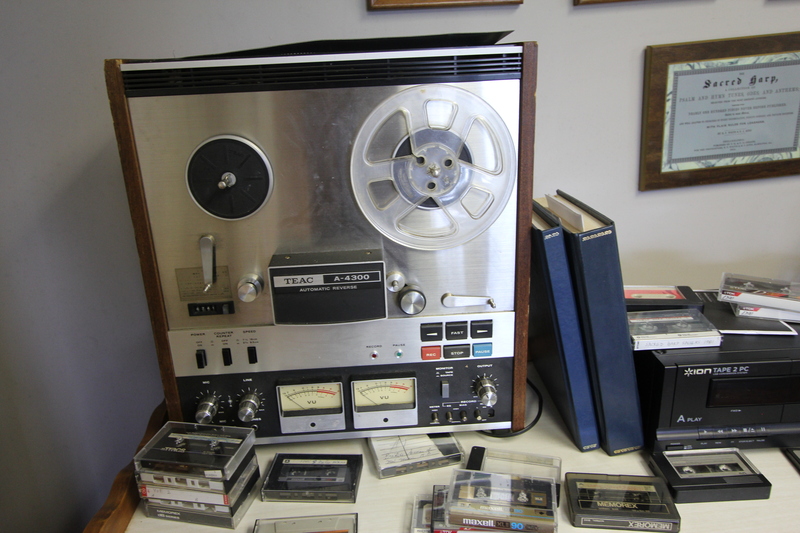 Tapes from the museum’s collection in line to be digitized. One of the best parts of being based in Carrollton for a month was the chance to attend singings every weekend. At every singing I went to, I was greeted with kind faces and welcoming words. One instance of kindness that particularly stuck with me was when B. M. Smith saw my well-worn Sacred Harp finally give in and fall to pieces in the middle of the square while I was leading at the Mt. Zion Memorial Singing, and at the next break he gave me a new copy. With his recent passing, the book he gave me bears so much more meaning. As the older generation of singers passes on, I feel more and more compelled to continue to connect with them and hear their stories, and to continue to sing and carry on the tradition with respect for its origins. I hope that the work I was able to do can be a catalyst for further development of the museum as a resource for Sacred Harp singers everywhere so that the Sacred Harp Museum can continue to preserve Sacred Harp’s past as a valuable resource for the singers of Sacred Harp’s future. For their support during my time at the museum, I would like to thank Jesse P. Karlsberg, Karen Rogers Rollins, Philip Denney, Gail Denney, Nathan Rees, Lauren Bock, Charlene Wallace, John Plunkett, Hugh McGraw, Alex Forsyth, Pitts Theology Library’s cataloging and archival team (Denise Hanusek, Armin Siedlecki, and Brandon Wason), Justin Bowen, Faith Riley, Henry Johnson, and Kathy Holland Williams. 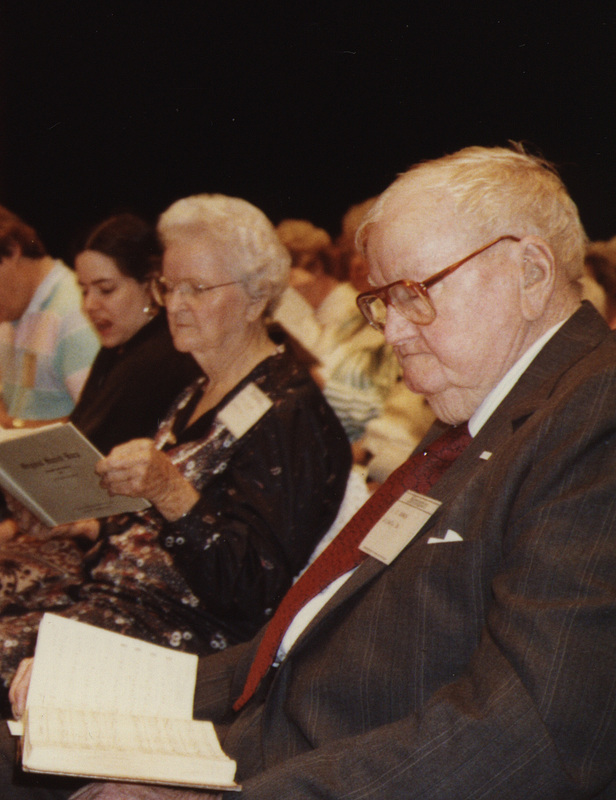 The eleventh issue of the Sacred Harp Publishing Company Newsletter features esteemed Sacred Harp singer, composer, and scholar Raymond C. Hamrick (1915–2014), a recipient of the Sacred Harp Publishing Company’s posthumous citation. The issue includes insightful essays by Hamrick himself, a video interview, and commentary on his many contributions to the Sacred Harp world. Printable version of the Sacred Harp Publishing Company Newsletter, Vol. 5, No. 2 (9.7 MB PDF). Our issue opens with South Georgia singer Mary Brownlee’s tribute to Hamrick, which eloquently evokes Hamrick’s courtly personality and significance to the South Georgia singing community. Jesse P. Karlsberg next offers an in-depth survey of Hamrick’s long life and wide-ranging involvement in Sacred Harp singing. The issue next turns to Hamrick’s own writing, sharing groundbreaking essays by the singer on Sacred Harp’s history and practices, some never before published. We begin with Hamrick’s two 1965 contributions to the Harpeth Valley Sacred Harp News: a report on growing appreciation of the work of composer William Billings and an evocative survey of role of shape-notes in American music history. The issue then turns to Hamrick’s previously unpublished 1972 study of tempo in The Sacred Harp, the first comprehensive examination of the subject. Hamrick’s 1986 contributions to the National Sacred Harp Newsletter follow. The singer’s celebrated study of the methods and results of pitchers at Sacred Harp singings appeared in vol. 2, no. 2 of the Sacred Harp Publishing Company Newsletter with an introduction by Ian Quinn. We include it in the print edition of this issue. We also reprint Hamrick’s convincing articulation of the value of shape-notes for composers. We next feature Hamrick’s 1996 return to the music of his favorite composer, William Billings, with an essay published in a special issue of the peer-reviewed music education journal, The Quarterly Journal of Music Teaching and Learning. This section of the Newsletter concludes with two additional previously unpublished contributions: an essay Hamrick wrote in the mid-1990s, offering a thorough insider’s account of the process of revising The Sacred Harp, and Alan Lomax’s brief 1982 interview with Hamrick, in which the Sacred Harp singer seems to surprise the veteran folklorist with his informed analysis of Sacred Harp practices. Our issue concludes with two more essays on Hamrick’s contributions to Sacred Harp singing. John Hollingsworth describes the story of editing and publishing The Georgian Harmony, a tunebook featuring nearly two-hundred of Hamrick’s shape-note tunes. Finally, Shaun Jex recounts Hamrick’s longstanding generosity in sharing his knowledge and experience with others. 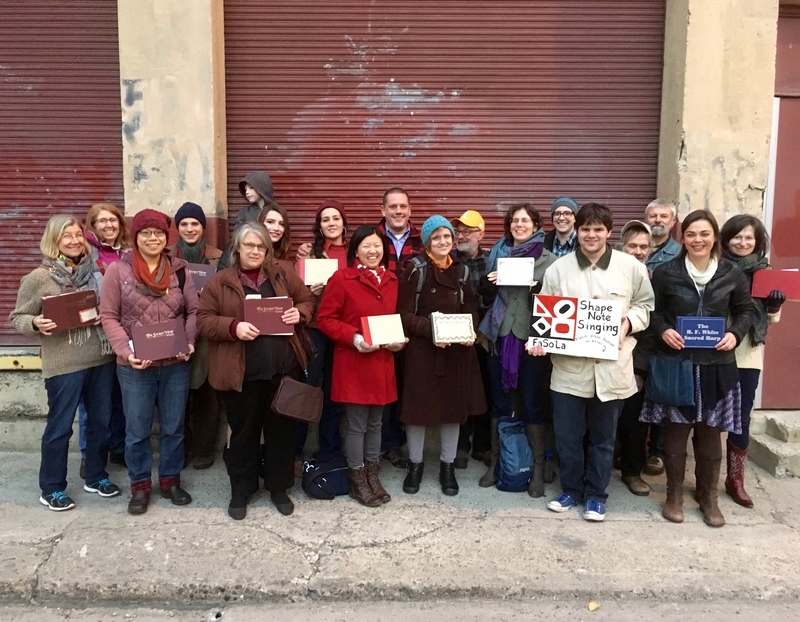 This issue of the Newsletter came together thanks to an especially large team of volunteers and the generosity of several editors and archivists. In addition to the many contributions of the Newsletter team of associate editor Nathan K. Rees and layout helpers Elaena Gardner, Leigh Cooper, and Jason Stanford, two singers—Marie Brandis of Portland, Oregon, and Justin Bowen of Nashville, Tennessee—transcribed essays written by Hamrick. Debra Madera and M. Patrick Graham of the Pitts Theology Library of Emory University, provided access to and scans of essays by Hamrick, correspondence, and tunebooks in the library’s Raymond Hamrick Papers. 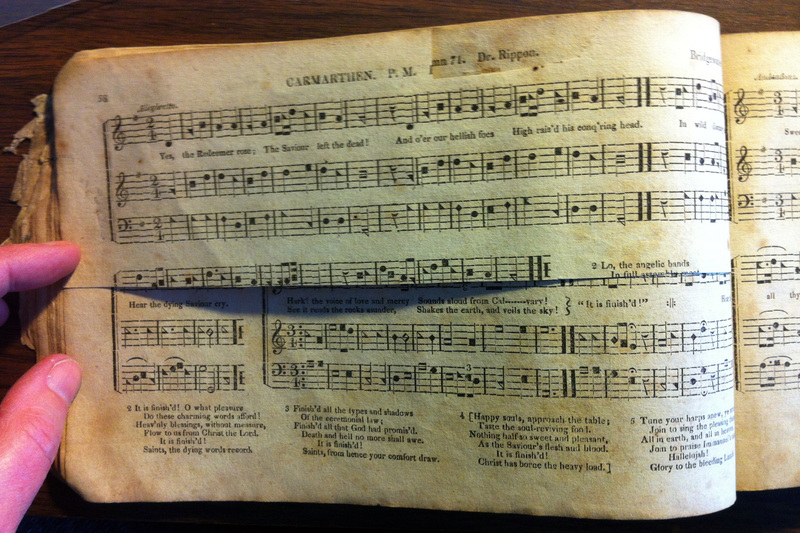 Nathan K. Rees also assisted in gathering and digitizing materials in the collection of the Sacred Harp Museum. Robert A. W. Dunn digitized copies of recordings testing submissions to the 1991 Edition in a private collection. Richard Colwell, founding editor of the Quarterly Journal of Music Teaching and Learning, Mary Leglar, past editor of Georgia Music News, and Timothy Reynolds, editor of the Harpeth Valley Sacred Harp News graciously permitted the reprinting of essays first published in these periodicals. Finally, Raymond C. Hamrick’s daughter Patti Hamrick Dancy combed her collection of family photographs and digitized many of the images of Hamrick with family and at singings that grace this issue’s essays. Thanks to her and to Susan Hamrick Hatfield for permission to enrich this tribute to their father through the inclusion of these photographs. As always, the Newsletter team welcomes your comments on these articles and invites your suggestions of future article topics. Please get in touch.